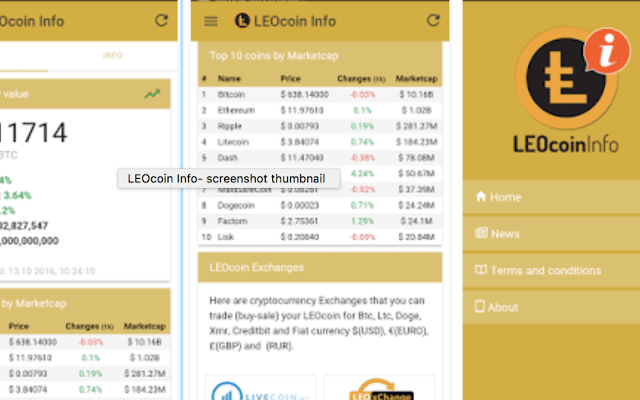 LEOcoin Community’s latest mobile application, LEOcoin Info for Android and iOS powered smartphones allows users to access basic information about the cryptocurrency at their fingertips. The LEOcoin Info app is a valuable education resource on cryptocurrency, blockchains, wallets and more. It offers real-time LEOcoin updates and trends along with a list of markets where it can be bought. LEOcoin is one of the fastest growing cryptocurrencies, created keeping the needs of businesses and entrepreneurs in mind. The rapidly growing LEOcoin community already has over 206,000 members and a strong merchant participation. The LEOcoin Info mobile application is a valuable addition to the existing arsenal of tools in the LEOcoin ecosystem. Along with key information points about LEOcoin, the mobile application also offers an overview of the whole cryptocurrency ecosystem with market capitalization data of the top digital currencies. Said Babic Mladen, a cryptocurrency expert. LEOcoin is strengthening its foothold in major economies as it continues to gain entry into new markets. Recently, LEOcoin and its team were well received at an event held in China. The “LEO at the Great Wall” event on 28-29 September 2016 saw a huge turnout with active participation from the LEOcoin community, entrepreneurs, bureaucrats and other important personalities in attendance. Find images from the LEO at Great Wall event here. LEOcoin Info mobile application has received a great response so far, crossing more than a thousand downloads within days of its launch on both the platforms. Find LEOcoin Info on Google Play Store and Apple App Store. LEOcoin is a cryptocurrency conceptualized by the well-known UK-based entrepreneurial skills training company Learning Enterprises Organization. LEOcoin is a decentralized, easy to use peer to peer digital currency maintained by LEOcoin Foundation. It is supported by a large community of established and aspiring entrepreneurs who are actively involved in building the LEOcoin community and increasing its adoption across the world.